Cub Advancement Day will be held on November 9, 2013 at Odell Elementary School, 1215 Moss Farm St. NW Concord, NC 28027. Event registration will start at 8 am with a flag ceremony set for 8:50 and class schedules to start at 9 am. 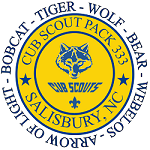 We will run 6 rotations for Tigers, Wolves, and Bears, and 2 activities pins for Webelos, one in the morning, one in the afternoon. We will also be providing Cub Scout Leader Specific training for any adult leaders that need it. Lunch is not provided so make sure you bring your own. A patch will be included for the event. The event will cost $15 with a $5 late fee kicking in on November 6, 2013. We appreciate everyone's patience as we strived to provide this event in multiple sites for convenience, in the end we were just not able to work out the logistics but hope that everyone has marked their calendars as the date has been the same from the beginning. Cub Scouts can expect many advancement opportunities including Den specific activities such as Archery, games, map and compass, citizenship and art. Webelos will have opportunities to earn activity pin requirements in the areas of Engineer, Ready Man, Scientist, Geologist, Citizen and Artist. More information will be forthcoming, and volunteers are needed to assist with this event! !